In “Think big, act small” – what does it mean in architecture?, Viktor Grgic says, "Let’s simplify things by talking about concrete things we actually do in software projects." Inspired by this, here's a summary of what I consider to be a minimal set of software architecture practices. Or to put it another way, here's what I do to get to a software architecture quickly. Risks: I like to identify and mitigate the highest priority risks - the things with a higher than normal risk of consequences if I don’t get them right. Good examples include not adequately catering for non-functional requirements or putting too much faith in an untried technology. Risk identification can be done with techniques like risk-storming and mitigated by prototypes, walking skeletons, etc. Vision: I create and communicate a vision so that we, as a team, understand what is being built and how *we* are going to build it. Note the emphasis on *we* ... I typically write code too. I use a collection of simple software architecture sketches to illustrate this. You can transcribe them into an electronic tool if you need to, but even a bunch of sketches on the wall can help tremendously to provide some focus. Just to be clear, this isn't about gathering all of the requirements in any detail and it's not about big design up front either. A few short workshops to gather requirements and do some collaborative design is all it takes to get to a decent starting point. Since I'm a visual person, I'll even start to draft up a context diagram during workshops with non-techie people when we're gathering requirements. That's basically it to be honest. I may do more if needed, but I don't generally do less than this. This isn't specifically an "agile" thing either, as I've followed this same basic approach for software projects of all shapes and sizes. The whole point of this is to introduce some direction and put some foundations in place that we can build upon. I have no problem with the architecture changing once we start writing code, but it should be done for a reason and in a structured way. 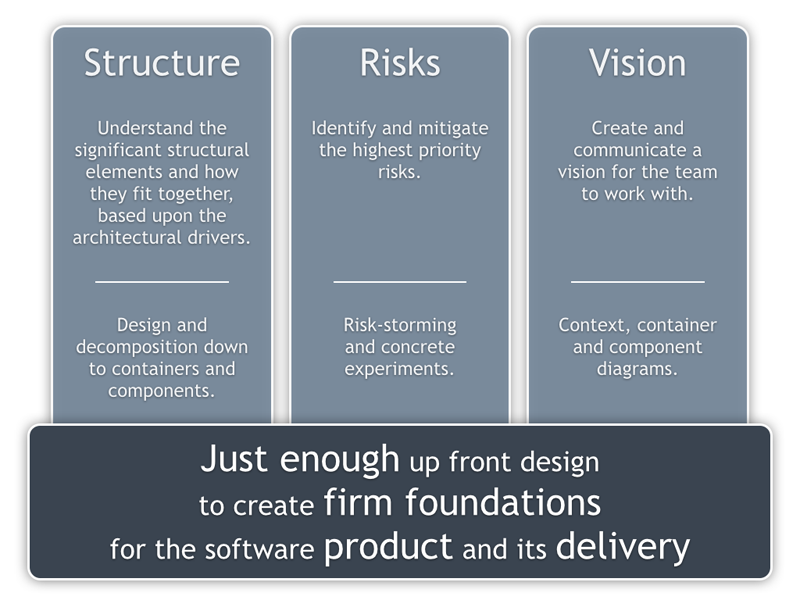 Structure, risks and vision ... it's all about having a starting point for the rest of the delivery process, however you slice it up.